California submitted its second-round application for federal Race to the Top school funding this month, with the Long Beach Unified School District playing a leading role in the development of the proposal. The application for the funding is part of LBUSD’s concerted efforts to raise student achievement while reducing the need for layoffs and other cuts necessitated by California’s ongoing budget crisis. LBUSD is one of seven California school systems that helped to develop the state’s application for up to $700 million in federal Race to the Top (Phase Two) funding. Many of the superintendents joined Gov. Arnold Schwarzenegger and the state’s top education officials recently at Long Beach’s Lafayette Elementary School for a signing ceremony to announce the state’s newly completed application. State officials selected Lafayette Elementary because they wish to replicate widely the school’s significant growth in student achievement. Lafayette’s state Academic Performance Index has grown from the 500 range to well beyond the state’s target of 800 in just a few years. The school’s fifth grade math proficiency surpasses the state average by 13 percentage points, despite significant poverty and language challenges. RACE TO TOP — State Board of Education President Ted Mitchell, California Gov. 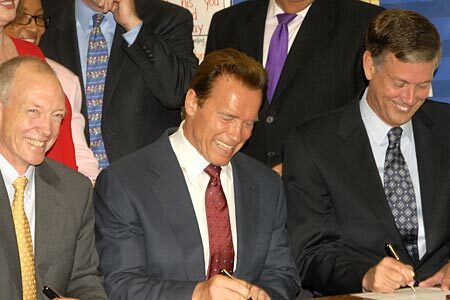 Arnold Schwarzenegger and Superintendent of Public Instruction Jack O’Connell sign the state’s application for federal Race to the Top funds at Long Beach’s Lafayette Elementary School.